The official USFWS Waterfowl Population Status 2018 and light goose hatch report has been released. We’ll cut through the report and summarize the key points of the light goose status for 2018. Nesting was delayed on average across the Arctic due to lingering snow and ice, however population numbers remain mostly steady along the 10-year trend. This fall’s juvie flight might be down a bit, but there will still be plenty of 1-2 year-old birds willing to visit your decoys – so don’t sell everything just yet! Wrangel Island breeding pairs were down from 2017, but the western Arctic/Pacific Flyway population is increasing overall. 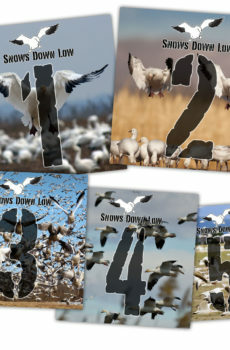 Greater Snow Geese rebound in 2018 with a +17% gain in surveyed breeding areas, which was down 18% in 2017. * It’s important to remember breeding surveys and subsequent reports are not a sampling of the entire light goose population, not all breeding areas are surveyed, and not all surveys and reports are available at time of publication. Some data from previous years is used in the USFWS population estimates. 2017 breeding population estimated at 446,600 (official numbers not available at time of report). Ross Geese are are annually surveyed at Karrak Lake in the Queen Maud Gulf region. Ross’s geese nest primarily in the Queen Maud Gulf region, but increasing numbers are nesting in other areas of the central and eastern Arctic and along the western coast of Hudson Bay. In 2018, spring phenology at Karrak Lake was delayed, and ice breakup (13 June) and first observation of goslings (3 July) were later than the long-term averages (11 June and 30 June, respectively; 1998–2018). Later than-average spring phenology was noted across most of the western and central Arctic. During the 2018 Midwinter Survey, biologists counted 311,300 light geese in southeastern Colorado, New Mexico, and the Texas Panhandle which was 45% greater than the 214,200 counted in 2017. Within the other portions of the Central and Mississippi Flyways, 4,061,200 light geese were counted in 2018, 19% greater than the 2017 index of 3,417,100. In 2018, spring phenology was delayed and breeding conditions were generally below average across much of the western, central, and eastern Arctic and Subarctic. Light geese in the Pacific Flyway (Pacific Flyway Population) are indexed by fall and winter surveys in California, Oregon, Washington and British Columbia. The 2017 Pacific Flyway Population light goose count was 1,906,800, 59% greater than the prior count of 1,199,600. Spring phenology was delayed across most areas in the western Arctic, northern Alaska, and on Wrangel Island. Spring and nesting phenology were delayed due to thick winter snow pack and cool weather in June, and predation levels were high during egg laying due to decreased lemming abundance.